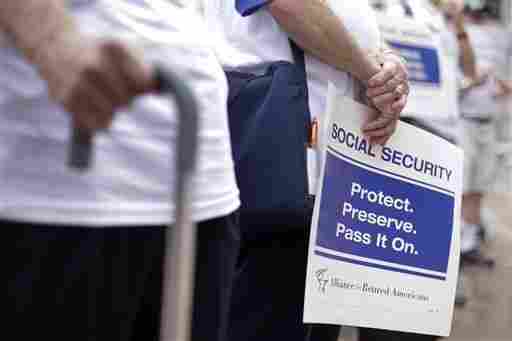 Obama Buoys Democrats By Dropping Social Security Cut Idea : It's All Politics You could almost hear the sigh of relief from Democrats when the White House announced President Obama's 2015 budget wouldn't include a proposal that would have lowered Social Security benefits. For a political party already facing a difficult midterm election the way the Democrats are, the fewer internally divisive issues the better. And few items were more divisive among Democrats than President Obama's previous proposal to reduce Social Security entitlement spending by using a less generous formula to calculate cost-of-living increases, so long as Republicans agreed to raise revenue by ending or reducing loopholes that would raise revenue. So you could almost hear the sigh of relief from Democrats when the White House announced that the president was dropping from his 2015 budget his proposal to use the chained CPI method for measuring inflation. That method gives a lower measure of inflation, which reduces Social Security benefits. The White House is scheduled to release its budget in early March. "President Obama's budget will be a powerful statement of Democratic principles," Senate Majority Leader Harry Reid said in a statement. "In particular, I commend President Obama for his commitment to keeping Social Security strong, and for rejecting Republican calls to cut badly-needed cost of living increases." Economic experts at progressive groups like the Center for Budget and Policy Priorities and the Economic Policy Institute also welcomed the president's decision. Obama's move makes it easier for congressional Democrats to argue more cleanly and forcefully that it's their party that's protecting the middle class, including their entitlement benefits, and to simultaneously accuse Republicans of wanting to reduce such benefits. The Democrats' main argument to voters this year is the old organized-labor question: "Whose side are you on?" They hope enough voters will answer that by deciding that it's Democrats, not Republicans, who best represent the interests of the majority of voters. Midterm elections tend to be relatively low-turnout elections as well. The electorate that does go to the polls tends to skew somewhat older compared with those who turn out only for a general election. By dropping his cost-of-living proposal, Obama is taking off the table an issue that didn't play well with many of those older voters. If the administration hadn't dropped it, Republicans could have more easily blunted Democratic attacks by pointing to the president's own budget. Republicans reacted by depicting the president's action as a capitulation to fiscal irresponsibility and as dangerous, not helpful, to Social Security's long-term stability. "This reaffirms what has become all too apparent: The president has no interest in doing anything, even modest, to address our looming debt crisis," said Michael Steel, a spokesman for Republican House Speaker John Boehner. "The one and only idea the president has to offer is even more job-destroying tax hikes, and that nonstarter won't do anything to save the entitlement programs that are critical to so many Americans. With three years left in office, it seems the president is already throwing in the towel."